Whey is a by-product obtained during coagulation of milk by using acid and/or rennet or physico-chemical process for the preparation of cheese, paneer, chhana, chakka and casein. Whey contains about 80-90% of the volume of milk that is used for production these products. It contains about half of the milk solids in which nutritional components such as lactose, protein and minerals are present in large amount . The current world production of whey is about 125 million tonnes, in which about 64% is produced in European countries and 24% in North America. In the absence of Systematic surveys/statistics, the predicted value of whey production in India is estimated at 4.84 million tonnes per annum . The chhana and paneer whey give the major contribution (about 80%) in total whey production . Considerable work has been done throughout the world to utilize whey for production of Whey Protein Concentrate (WPC), whey powder, lactose, lactic acid, whey paste etc. . The conversion of whey into beverages through fermentation or without fermentation is one of the most attractive a venues for the utilization of whey for human consumption. Beverages based on fruit and milk products are currently receiving considerable attention as their market potential is growing. Besides being delicious, these beverages are highly nutritious. In terms of functionality, whey protein enhances protein content of beverage while improving its quality. Mango (Mangifera indica L.) is one of the important fruit crops grown in India, which has excellent flavour, attractive colour and delicious taste with high nutritional value. As it contains more than 80 per cent moisture, it has very poor keeping quality and cannot with stand any adverse climatic condition during storage. This results in loss of 30% of fruits every year . To overcome this post harvest losses and to increase the shelf life, the surplus mango has to be processed into shelf stable products like sterilized pulp or dried flakes and powders [6,7]. In the present study attempt was made to formulate a whey based mango beverage utilising chhana whey, whey powder and whey protein concentrate. Whey powder, sugar, fructose was procured form local market of Delhi, Whey protein Concentrate (WPC-70) was supplied by Mahaan Proteins, New Delhi. Sodium nitrate was procured from Qualigens, Pectin from Danisco. Mango flavour was supplied by Sonarome, Yellow colour by CHR-Hansen and Mango powder was supplied by Aarkay Foods Pvt. Ltd., Ahmadabad. Lactic, citric and tartaric acid mixture was procured from local market. Sodium chloride was used of Tata Salt. Vitamin premix was supplied by Piramal Healthcare. The chhana whey was obtained during the manufacture of chhana using milk containing 3.5% and 8.5% solid not fat (SNF). Milk was coagulated using 1.5% citric acid (Eagle Brand) solution as coagulant. The whey was filtered and centrifuged to remove the fat. Fat separation was done at 45°C. To precipitate proteins whey was heated to 105°C at pH 4.6 and then was filtered and stored under refrigerated condition until use. Totapuri mangoes having uniform colour and maturity were selected for the experimental work. Ripe mango fruits were washed with running water, hand peeled and cut. The fruits were manually peeled and juice was extracted. The pulp was strained through muslin cloth to remove stone cells, to avoid coarse pulp particles and to have only fine particles of almost colloidal consistency. The pulp was kept under refrigerated condition for further use. 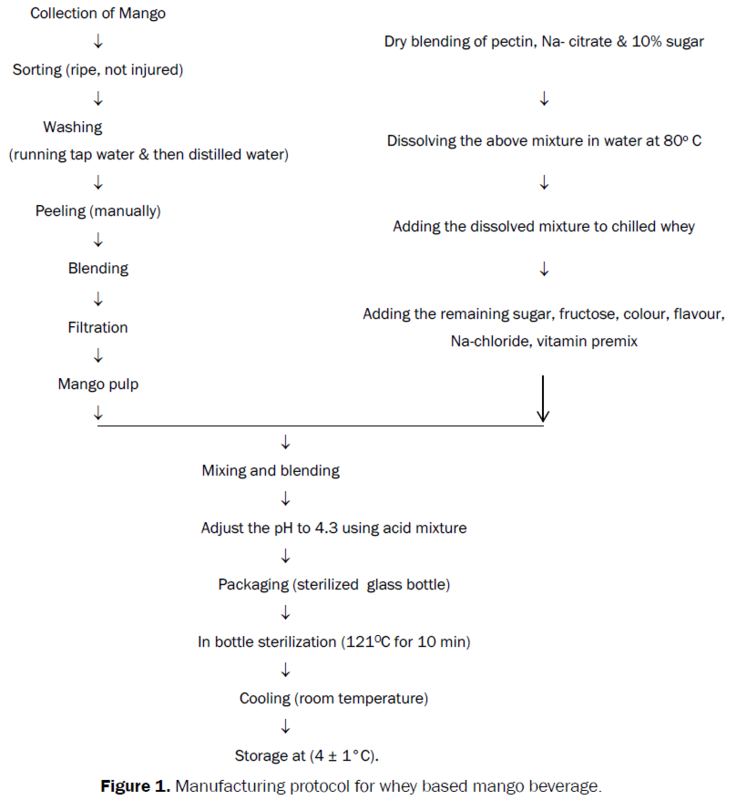 The whey based mango beverage was prepared by the methods mentioned in Figure 1. Mango pulp was added in five different levels of addition (2, 4, 6, 8, 10%), the best result obtained on sensory basis is given in Table 1. In each lot about 2-3 lit. of beverages were prepared and experiment was repeated for three times. Bottles containing beverages were stored at refrigerated temperature (4 ± 1ºC) for 30 days. Samples were drawn at intervals of 10 days and evaluated for microbial properties. Table 1. Formulations for whey based mango beverage. Figure 1. Manufacturing protocol for whey based mango beverage. The best combination of the whey powder based mango beverage dry mix is shown in Table 1. All of the ingredients were weighed and dry mixed in a planetary mixer. Three different levels each of whey powder (35, 40, 45%) and Mango powder (10, 15, 20%) were used. The powdered dry mix was hermitically sealed in laminate pouches and stored at room temperature for further use. The dry mix is used at the rate of 18% and 82% water to serve a ready to serve drink (Figure 2). The prepared drink was then filled in pre-sterilised glass bottles, followed by crowning. In-bottle sterilization was done at 121°C for 10 min. Bottles were cooled at room temperature and then stored under refrigerated conditions (4 ± 1°C). In each lot about 2-3 lit. of beverages were prepared and experiment was repeated for three times. The best combination of the whey protein concentrate based mango beverage dry mix is shown in Table 1. All of the ingredients were weighed and dry mixed in a planetary mixer. Three different levels each of whey protein concentrate (25, 30, 35%) and Mango powder (10, 15, 20%) were used. The powdered dry mix was hermitically sealed in laminate pouches and stored at room temperature for further use. The dry mix is used at the rate of 18% and 82% water to serve a ready to serve drink. In each lot about 2-3 lit. of beverages were prepared and experiment was repeated for three times. The prepared drink was then filled in pre-sterilised glass bottles, followed by crowning. In-bottle sterilization was done at 121°C for 10 min (Figure 2). Bottles were cooled at room temperature and then stored under refrigerated conditions (4 ± 1°C). The moisture, fat, total solids and titratable acidity was determined as per the method described in IS: 1165 . Total Sugar was determined by the methods described by . The sensory quality of fresh and stored product was determined by using 5 judges using 9 point hedonic scale. Representative, 10 ml was aseptically mixed with 90 ml distilled water and homogenized by shaking. Subsequent decimal dilutions were prepared with the same diluents and in all cases duplicate-counting plates were prepared of appropriate dilutions . Total viable count was carried out using the pour plate method described by . Yeasts were enumerated by surface plating on malt extract agar (Oxoid) with 0.01% chloramphenicol as bacterial inhibitor and incubated aerobically at 25ºC for 2-3 days . The coliform test was done according to  by plating one ml sample onto MacConkey broth media. The plates were incubated at 37ºC for 48 h and the counts were presented as colony forming units per gram (cfu/g). Plates showing positive coliform were subjected to the confirmed test using Brilliant green bile lactose broth in test tubes with Durham tubes. The test tubes were then incubated at 44ºC for 48 h. Each confirmed positive tube was sub cultured into E.C. broth medium and then incubated at 44.5ºC for 24 h. Tubes showing any amount of gas production were considered to be positive E. coli presence. The changes occurred in three beverages manufactured and stored at refrigeration temperature is depicted in Table 2. The final composition of Whey based mango beverage (WMB) is as shown in Table 2. A slight increase in acidity and decrease in pH was observed. The average fat content was 0.13%, protein content was 0.75% and concentration of 17.8o Brix. Whey powder based mango beverage dry mix (WPMB) had a average moisture content of 4.5%, fat (0.8%) and protein content of 15%. The drink prepared from WPMB dry mix had a average fat content of 0.14%, protein content of 2.7% and total sugar content of 18.5%. Similarly whey protein concentrate (WPC 80) based mango beverage dry mix (WPCMB) dry mix content for moisture, fat, protein and total sugar was 4.8, 6, 62 and 18.45% respectively. The drink prepared from WPCMB had a fat, protein and total sugar content of 1.08, 11.16 and 3.32% respectively. The results obtained in the present investigation are in confirmation with the results obtained by . Table 2. Chemical constituents of fresh and stored whey based mango beverage. The initial acidity of the WMB (0.405%) had increased to 0.435% after 30 days of storage. This increase in acidity was due to the conversion of lactose to lactic acid, and formation of other organic acid by citric acid inherently present in the mango puree. On storage some of the protein also gets converted into amino acid. The initial pH of 4.3 decreased to 4.11 after 30 days of storage. This decrease in pH is due to increase in acidity content in the stored product. Similar increase in acidity for WPMB and WPCMB was observed which reached a final value of 0.425 and 0.440% respectively. The change in acidity was in conjunction with the results reported by Saravana and Manimegalai  and Teotia et al. . Non-significant changes were observed in the fat, protein and total sugar content in all of the beverages after 30 days of storage. Total Viable Counts (TVC) were high ranging from 2.38×104 cfu/mL at zero time and reached 2.60×104 cfu/mL at the end of storage period in Whey based mango beverage (WMB). Similarly the total viable count in whey powder based mango beverage dry mix (WPMB) and whey protein concentrate based mango beverage dry mix (WPCMB) after 30 days of storage was 2.30x104 and 2.45x104 respectively. Yeast count were 3.8×104 cfu/mL, 3.9 ×104 cfu/mL and 3.95×104 cfu/mL at zero time and reached 3.67×104 cfu/mL, 3.75×104 cfu/mL and 3.80×104 cfu/mL for WMB, WPMB and WPCMB respectively. Faecal coliform showed a decreasing trend as the storage period increased, while non-faecal coliform count increased as the storage progressed (Table 3) and the same trend was reported by Ismail et al. and Mahale et al. . The sensory evaluations of prepared beverages were performed by a panel of 5 judges using 9-point hedonic scale to know the overall acceptability of the product. The overall acceptability of the beverages was found to be good at the end of 30 days of storage period. The score of prepared beverage in fresh condition was 8.5 and at the end of 30 days of storage period the scores of corresponding samples were found to be 8.4. Gradual decrease was observed in overall acceptability for whey based mango beverage (WMB), while it was affected significantly for whey powder based mango beverage dry mix (WPMB) and whey protein concentrate based mango beverage dry mix (WPCMB) (Table 4). This was due to increase in viscosity and darkening of the colour and pungency in taste in case of WMB, while the WPMB and WPCMB were still good in colour without any objectionable flavour and may be attributed to the changes occurring during storage of beverage as reported by Shekilango et al. .
Table 4. Sensory characteristics of fresh and stored whey based mango beverage. The results of the study showed that whey in the form of acid whey, whey powder and whey protein concentrate could be successfully incorporated in beverages. The Storage of whey-based mango juice significantly resulted in increasing the acidity, and decreasing in the pH in all the three samples. However, the overall acceptability of the whey protein concentrate based mango beverage dry mix (WPCMB) was good after 30 days of storage at refrigeration temperature. Khamrui K, Rajorhia GS (1998) Making Profits from Whey. Indian Dairyman 50: 13-18. Raju PN, Rao LH, Devi NL. (2005) Whey protein and their uses in food industry. Indian Food Industry 24:19-27. Gupta VK, Mathur BN (1989) Current trends in whey utilization. Indian Dairyman 41: 165-167. Panesar PS, Kennedy JF, Gandhi DN, Bunko K (2007) Bio-utilization of whey for lactic acid production. Food Chem 105:1-14. Thind KK, Grewal KS, Bakshi AK (2002) Method of preparation and keeping quality of reconstituted skim milk based mango beverage. Beverage and Food World 29: 60-62. Saxena R, Arora VPS (1997) Consumers of processed fruit and vegetables products. An analysis of buying behaviour. Indian Food Industry 16: 25-36. Srinivasan N, Elangovan S, Chinnaiyan P (2000) Consumer perception towards processed fruit and vegetables products. Indian Economic panorama 10: 11-12. Harrigan WF, Mac-Cance ME. (1976) Laboratory Methods in Food and Dairy Microbiology. Academic Press, London. Harrigan WF (1998) Laboratory Methods in Food Microbiology, Academic Press, London. Patel S, Prashant S, Choudhary PL, Bakane PH (2006) Development and evaluation of whey based mango herbal (ginger) beverages. Beverage Food World 33: 15-19. Saravana KR, Manimegalai G (2005) Studies on storage stability of whey based papaya juice blended RTS beverage. J Food SciTechnol 42: 185-188. Ismail AE, Abdelgader MO, Azhari Ali A (2011) Microbial and chemical evaluation of whey-based mango beverage. Advance Journal of Food Science and Technology 3: 250-253. Mahale DP, Khade RG, Vaidya VK (2008) Microbiological analysis of street vended fruit juices from Mumbai City, India. Internet Journal of Food Safety 10: 31-34. Shekilango SA, Jelen P, Bagdan GC (1997) Production of whey-banana beverages from acid whey and over ripe bananas. Milchwissenschaft 52: 209-212.